The British Footwear Association were once again very pleased to be able to attend and be part of the 2017 Footwear Industry Awards held on the evening of Sunday 19 February at the National Conference Centre Birmingham. This annual event takes place at the same time as the MODA Fashion and Footwear exhibition and as usual was well supported by companies, brands and key figures from across the UK footwear industry who once again took, an all too infrequent chance, to get together to socialise and network at this prestigious event. 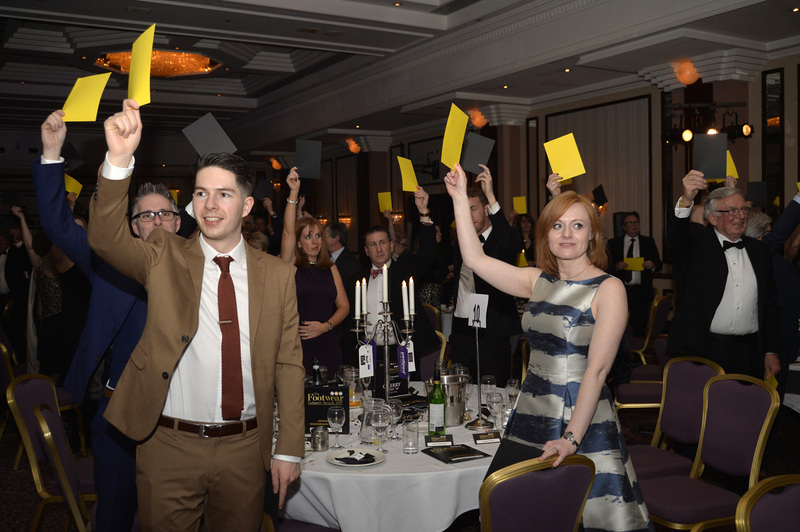 Once again the Footwear Industry Awards gave us a chance to celebrate all that is great about the UK industry and to recognise the brands, retailers and individuals, many of them unsung heroes, who continuously contribute to the success of the sector. I would personal like to congratulate all those who were nominated and, of course, the winners on the night itself. In an increasingly changing and competitive world I was particularly proud to be called on to present the award for the Best Multiple Retailer to Charles Clinkard – a fantastic business with a great history of selling quality footwear and a deserved winner. I would also like to take the opportunity to thank all those who participated in the charity “Black and Gold” game which raised vital funds for Footwear Friends and to the Charity themselves for their ongoing support for those who have worked in the footwear industry and now find themselves in difficult times.